Our current unemployment rate is 6.7% as of December 2013. Thats a lot better than it was a couple years ago but its still not a great number. 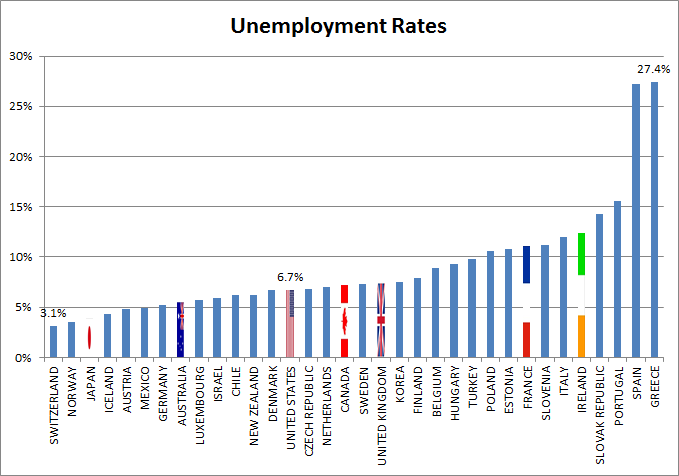 I got the list of countries unemployment rates from Wikipedia as of January 2014. The data there is subject to change and the rates quoted are from slightly different time periods per nation. You can see there that the USA is right around the middle. In fact we're a bit better. The median is 7.3% and the average is 9%. And you can see theres quite a range. Greece is all the way up at 27.4% and Switzerland is only 3.1%.